Having recently reviewed the debut release from New York’s newest label SpinSpinNYC, Nutritious Presents Duke Williams and The Extremes, they’ve since released their second release. 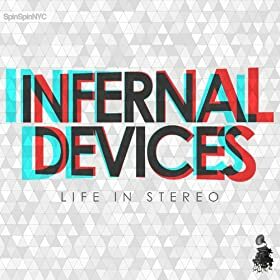 This is Infernal Devices’ Life In Stereo, the debut E.P. from the Brooklyn based dance duo. Infernal Devices are Mark Allen and Andy Miccolis, and having spent the last few days immersed in the six tracks on Life In Stereo, it sounds as if they’ve a big future ahead of them. Mark and Andy describe their music as “retro futurism for the post disco landscape.” Their music is a fusion of pulsating beats, melodic hooks with a twist of eighties synth pop and a sprinkling of sci-fi. Not only do they set about creating a sound that will light up any dance-floor from New York to North Carolina, and everywhere in between, but they like to put on a breathtaking spectacle of a live show. Although Infernal Devices create music, this is taking dance music to the next level, both sonically and as a spectacle. Truly, this is the complete package, something befitting of the 21st Century. So, for anyone whose yet to hear Infernal Devices music, I’ll tell you about their six-track E.P. Life In Stereo. Opening Life In Stereo is the title-track Life in Stereo, a track where Kraftwerk, eighties synth pop, dance-floor beats and poppy hooks combine. It’s a track that takes you across five decades, from the seventies onwards. As the track opens, the synths immediately make you think of Kraftwerk. So does the wistful vocal, which has a Euro Pop flavor that’s combined with Bowie’s Berlin period. Meanwhile the pulsating dance-floor friendly beat and synths fuse synth pop with deep house. There’s even a New Wave sound to the vocal and synths. The track is a combination of influences and genres. This is all put into Infernal Devices musical melting pot and give a stir by Mark and Andy. What comes out is contemporary, innovative sounding track, where old becomes new, with a little help from Infernal Devices. Passengers combines pounding beats with subtle, distant keyboards before confident flourish of synths enter. The beats sound as if they belong on a house track, while the synths range from synth pop, new wave and techno.They’re joined by a vocal delivered in an impassioned style. Stabs of marauding synths, thunderous beats and bursts of rocky guitars combine. By then the vocal is delivered in an earnest, whispery style. As the track progresses, the arrangement grows. Now the track references everything from techno, synth pop, New Wave, house and sometimes, thanks to the keyboards, prog rock. Still Infernal Devices continue to drive the arrangement along. In doing so, they create a genre-straddling, dance-floor friendly track. We Are Alone is a track that sounds like a lost gem of a New Order track from the nineties. When the synths and thunderous beats combine with a vocal that sounds like Barney from New Order. You’re almost checking that this isn’t Manchester’s finest you’re listening to. The similarities are uncanny. That’s how good the track is. This must be released as a single and given a promotional push. As the track moves on, it’s like New Order given a makeover. Filters and delay are added, as the bouncy arrangement reveals its poppy brilliance. Quite simply this is Infernal Devices at their best. It’s melodic, full of poppy hooks, pounding beats and given a futuristic makeover. Truly you’ve got to hear this track, it’s unmissable. Move On is the last of the four original tracks on Life In Stereo. The other two tracks are remixes of Life In Stereo. Edgy, buzzing synths and pounding beats combine before Infernal Devices pick up where they left off on We Are Alone. Again, there’s a New Order influence, but not as obvious. Mostly, it’s the vocal that makes me draw this comparison. There’s a vulnerability to the tender vocal, while the synths and drums envelop it. It’s indie-rock meets the dance-floor with a 21st Century twist. Like the previous track, it has the same melodic quality, where retro meets a futuristic sci-fi sound. With a vocal that’s both filled with hope and vulnerability, this is just the finishing touch to a track where old meets new and results in something fresh and really exciting. So, Infernal Devices are just the latest dance-floor duo from Brooklyn, New York. They pick up the baton from JohNick and are left to carry the torch as Brooklyn’s finest purveyors of dance music. Like JohNick before them, Infernal Devices are innovators. They take a melting of influences and genres and transforming them into something fresh, new and exciting. Listen carefully, and you’ll hear everything from Kraftwerk, techno, synth pop, New Wave, house and even briefly, prog rock. Then there’s the New Order influence on both We Are Alone and Move On. Of the two tracks, We Are Alone is like a lost gem of a New Order track, one that sounds like something New Order would’ve recorded in their prime. Since I first heard the track I’ve been smitten. So good is the track, it must be released as a single. It’s a glorious track, one which is the best track on Life In Stereo. Apart from the four tracks I’ve mentioned on Life In Stereo, there are also two remixes of the title-track. These remixes of Life In Stereo are by Savoir Adore and the Nutritious Remix featuring Chuck Love. Both bring something new and different to the original version and transform it. Indeed, it’s interesting comparing the original with remixes. All too often remixes don’t bring anything new to the party, but these two remixes do. Overall, Infernal Devices E.P. Life In Stereo is an innovative, exciting and genre-crossing collection of tracks from the Brooklyn dance duo, who I believe, have a great future ahead of them. I’m sure that after you’ve heard Life In Stereo, that you too, will be as excited by Infernal Devices’ E.P. Life In Stereo as I am. It’ll only take one listen, and you too will be smitten, by Infernal Devices’ genre-sprawling six track debut E.P. Life In Stereo, which is out now, on SpinSpinNYC. ← LOVING ON THE FLIPSIDE.